Hyundai Forklifts Australia (HFA) has launched its brand new 9-series reach trucks featuring a completely new design at the CeMAT Australia 2015 logistics fair. Hyundai's new 9-series reach trucks were officially launched at last week's CeMAT Australia 2015 trade fair. The new BRJ-9 series sit-on reach trucks which capacity ranges from 1.4 to 2.5 tonnes features a curved exterior with a two-toned graphic model identifier and co-ordinated overhead guard and upper frame. The strong overhead guard meets ISO 6055 and ANSI regulations to protect the operator while carrying out potentially hazardous tasks in the warehouse. In addition to its "slick aesthetics", HFA adds the new series stands out for its several clever yet simple design components including an optimised lift cylinder for greater visibility; an added middle step for easier access to the machine; and a hinged rotating hood for easy maintenance and servicing. The new range also features an ergonomically designed fingertip lever hub for enhanced operator control and a new joystick option for smoother manoeuvrability and less strain. The BRJ-9’s 3.5 inch LCD display has full colour visibility and includes an easy-to-use 12 button key pad arrangement. It displays several items including operation errors, system faults, battery levels, hour meter and more for optimum operating conditions. Also available on all four BRJ-9 models is the optional rear view camera and advanced LCD colour monitor with a 3.5-inch graphic smart display which allows operators to easily and efficiently control the machine. The advanced monitor shows several types of information including speed and accelerator level; steer angle; travel direction; battery discharge indicator; hour meter and working mode. The optional load indicator displays the load weight and height of the forks and the operator can select various performance modes to meet different working conditions. According to HFA, the new machines’ compact design and minimum turning radius make them ideal workhorses for narrow aisle operation in warehouses. Its versatile multi-roller reach assembly allows for smooth, controlled and safe load-handling with extended reach. Safety is also an integral part of the BRJ-9 series’ design, such as the anti-roll-back system which prevents the machine from rolling back on a ramp. 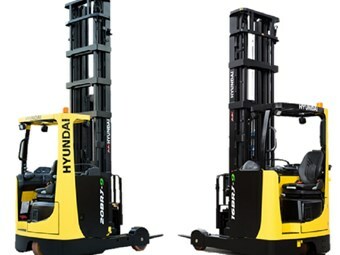 Find out more about the new Hyundai 9-series reach trucks on HFA’s website. CeMAT is the world’s largest materials handling and intralogistics expo and was held in Australia for the very first time in 2015. It ran from May 5-7 at the Sydney Olympic Park this year and will return next July in Melbourne. Find reach trucks for sale. Look up reach truck specifications.